BHLC is pleased to offer a slipper service. It builds on the experience of the service previously provided by the PHYLLIS team and Warwickshire County Council. We offer a range of sizes, ladies sizes 3-8 and men’s sizes 6-12. 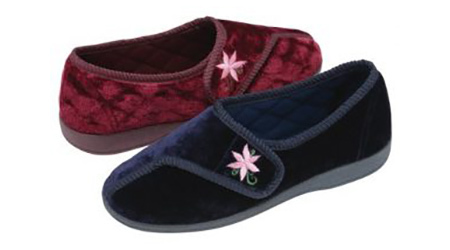 All our slippers have Velcro fastenings so they can be adjusted for a comfortable and safe fit. Try before you buy, as correct fitting is essential to reduce the risk of falls. If you would like to know more about our slipper service, please download our Slipper leaflet, or pop in and see us! Our slippers are perfect for preventing falls around the home.